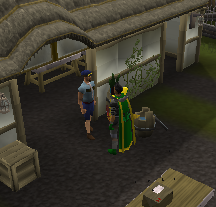 Talk to Horacio in the Ardougne Mansion. 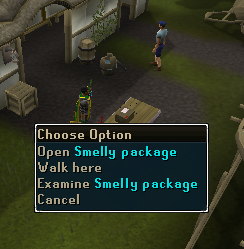 Head to Horacio in the Ardougne Mansion and talk to him. He will explain that he is the gardener at the mansion, and wants to plant a Vine in the garden, but will need your help. 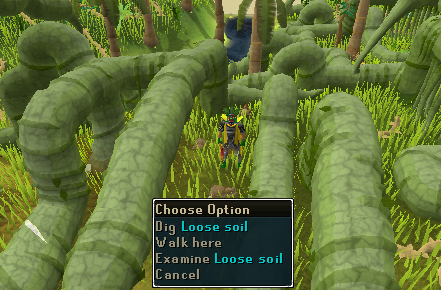 Another problem is that it only grows in one place, just east of Shilo Village. 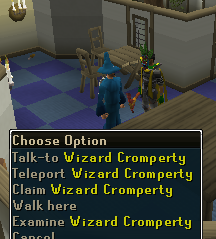 After finishing the conversation with Horacio, head to Wizard Cromperty in the north-east corner of Ardougne and speak to him. He will tell you more about the Vine, and that he had specialist equipment being delivered to help him with his studies, however it hasn't arrived, so make your way south to the R.P.D.T. depot and speak to one of the employees. They will explain that there is a package that smells a lot, and they aren't going to do any work until it's moved, so open the Smelly Package in the north-east corner of the depot. Upon opening you will find what was smelling so bad - a hand with a scrap of wizard's robe attached. Head back to Wizard Cromperty, telling him that his package should arrive soon. When it does arrive, he will be furious due to the fact that his equipment is broken! Although this may sound like terrible news, his superb equipment consisted of the simplistic Pot Lid, so you'll have to get hold of one. Pot Lids can be made by using a Bucket of Water with Clay to get Soft Clay, then using the Soft Clay with a Potter's Wheel to get an Unfired Lid. Finally, the unfired lid needs to be fired in a Kiln, and there's your lid. The Lid has to be made after you are told to make it otherwise you will be told the lid is too small. 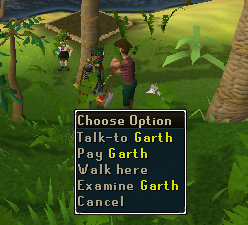 Take this back to Wizard Cromperty, and after explaining how to store the Vine Root he'll tell you to talk to Garth who can be found next to the Fruit Tree Patch in Brimhaven. It's also worth getting hold of some Armour, Food and Antipoison Potions due to the monsters found within the Vine Maze that can hit into triple digits and poison. 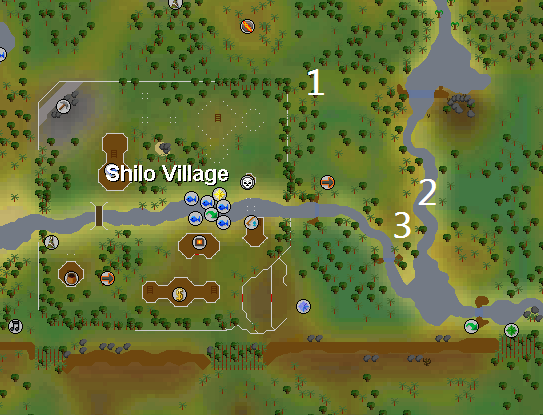 The maze can be found just to the east of Shilo Village, with the entrance near to the north-east corner of the village. To enter the maze, on the north side is a short stub sticking out. 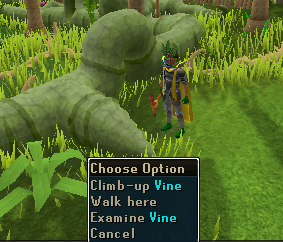 Click on the end of this stub, and choose to Climb-up Vine to enter. Throughout the maze are numerous obstacles you need to get past such as vines you can climb up to get to different levels and ways to get on and off the vine in a similar way to how you enter the maze. When on the ground level, there are hanging vines that must be cut with a Machete before being squeezed through. As well as these obstacles to take you to the other side, there are Holes in the ground and Vines that will take you to different areas, so are good for fast transportation. *If you fall off the vine across the river, you can Enter Holes in the ground or the vine itself to quickly get around the maze. This can also be used to get around the maze quickly in a random manner. Enter the maze through the entrance vine in the picture above. Head east and climb up the vine. Keeping south, go down the middle path and climb down the vine. Move west and climb down the vine onto the jungle floor. Head south and cut down the vines. Once cut, crawl through the cut vines. Move east into another area. You will notice two tropical trees, each with a vine next to them. Climb up the vine nearest to the southern tree. Climb up the southern vine. It should be very close to you. Look to the east. You should see a hanging vine. Swing from the vine to arrive in a new set of vines. Head north and climb down the vine. Head east and climb down the vine onto the jungle floor. Head south, cut down the vines, and crawl through them. Continue south and squeeze through the vines. Continue south and climb up the vine. Climb up the vine in front of you. Head north, head east, and climb down the southern vine onto the jungle floor. Head south, cut down the vines, and squeeze through them. Climb up vine to the east. Head south, then west round the corner, then climb up the vine. Continue west and climb down the vine. Head north, and climb up the vine. Cross the vine over the river. Head west, keeping south, then double back on yourself to go east to find a vine to climb down. Head south, and climb down the vine onto the jungle floor. Once here, you must dig with your Spade on one of the sections of Loose soil. The Root will then be exposed, so you will be able to cut them. 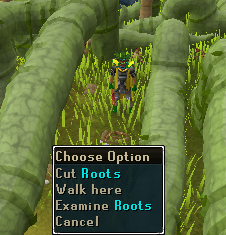 Do not use any teleports until you have sealed the Roots in the Pot. Use the Root Cutting with the Plant Pot to get a Potted Root. Wait a few seconds and a message will appear telling you whether it will either survive or wilt away. If it wilts away, dig on a different section of Loose soil, then cut the newly exposed root. There are six plots of loose soil that you can check. If you are unsuccessful on the first plot, move onto the next. One of the six plots will be correct. If the Root survives, use it with the Pot to get a Sealed Pot. Once you have this, it is safe to teleport away. With the Sealed Pot, head back to Horacio and talk to him. He will tell you that now you've got the Root, you'll need to grow it too, so use the Sealed Pot on the nearby Vine Patch with a Gardening Trowel in your inventory. 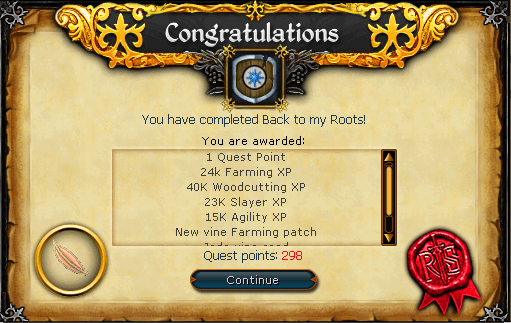 A cut-scene will follow in which the Vine will grow out of control because you apparently forgot to prune it. Because of this, you will have to fight it to get it to disappear. It is a level 130 creature that will mainly use Melee attacks, but will poison you with a poison. 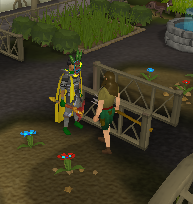 You will also only be able to cause any damage with a Woodcutting Axe, so having a Rune or Dragon one would be an advantage over one made of Steel or Mithril. An Abyssal Whip, Dragon Scimitar, or other 'normal' weapons will hit no damage at all, so make sure to have a Hatchet with you. To keep the poison under control you could either drink a dose of Superantipoison before the battle, or take several normal Antipoison Potions in with you. To stop the damage, turning on Protect from Melee will work, so a Prayer Potion or two would be helpful, although there is a very occasional Magic attack that will also be used, so a few pieces of food will also be needed, especially if you haven't drunk some Superantipoison. If you want to make sure your Prayer is fully charged to start with, there is an Altar to pray at just to the west of the mansion. The 167 combat levels are mainly made up by Defence and Constitution, so boosting your Attack and Strength levels before battle would be advantageous. 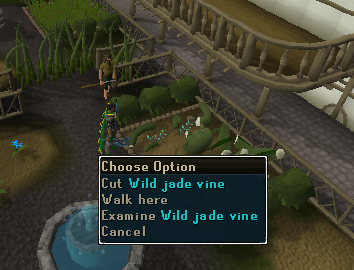 There are only three ways to leave the battle - Teleporting, Dying, or killing the Vine - so bring a Teleport if you are unsure whether you will succeed in killing it. Once you have the equipment you want, remembering a Hatchet and some Secateurs, choose to Attack the Wild Jade Vine, and confirm that you are sure, being taken into battle in the process. The Vine will slowly become smaller, and each time it does so, you will need to re-attack it. Eventually it will be killed, so choose to cut the last little stump, and you will leave the hidden world of battle. Talk to Horacio, and you'll complete the Quest!